People ask me if I’m a singing teacher or a vocal coach. voice trainer – like a body trainer. The conclusion I came to is that singing is all about muscles. Now OBVIOUSLY you have to sing correctly, but it’s not enough to sing correctly-you have to work the muscles. And if you have strong muscles, you can sing over anything and everything except laryngitis and one other bug that makes you cough and your throat tickle constantly. I give you a working knowledge of your voice and how to use it. Most of my students who have been with me for years have three to four octave ranges and can sing anything and everything they want with power and confidence. I have “songfests” about every three months where my students get up to sing at a Karaoke restaurant (without the words in front of them). I believe it’s important to get up in front of people often to walk through your fears -and we ALL have fears at first. And obviously, as with anything, practice makes perfect. People who know Terri now know her as Terri Weiss. But in her professional career she was known as Terri Baker. 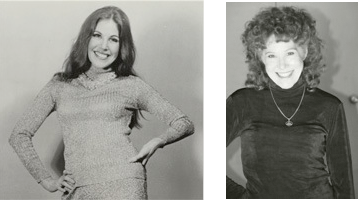 Terri started studying singing when she was ten years old and even though her love was opera, she appeared regularly with Buck Owens & Merle Haggart on Cousin Herb’s Trading Post Gang on Bakersfield television. Even as a youngster she sang opera, pop and country forming a habit that would last a life time and become her signature as a singing teacher. She has sung everything and teaches that you CAN sing everything. From ten till 16 she sang for state fairs, churches, clubs and other television shows. Having played the lead in Caesar and Cleopatra in High School and fallen in love with Acting, at 16 she moved to Hollywood to go to Hollywood High school because her acting coach encouraged her to do so. After graduating from high school she auditioned for the famed Neighborhood Playhouse in New York and received a full scholarship. Arriving in New York when she was 18 years old, Terri says she thought she’d died and gone to heaven. After graduating from the Playhouse, she appeared on Broadway, in FADE OUT FADE IN with Carol Burnett and understudied Betsey Palmer in SOUTH PACIFIC at Carnegie’s Judsen Hall. She studied voice with all the majors of her day and studied dance with Martha graham and Matt Mattox. I consider myself a vocal trainer. Like when you get a trainer to go to the gym. I’ve formed the opinion that singing is more about muscle than anything else. I train you so your muscles will support any kind of music whether it’s opera or hard rock. In 1971 she went “on the road” as a headliner in supper clubs around the USA, Canada and the Caribbean. At times working as the great jazz musician, Lionel Hampton’s featured singer. When Disco took over the night club circuit, she got her own band together singing every kind of music. “To keep the band working”. “I’d do jazz in New York, country in Alabama, show tunes in the big rooms in South American, Pennsylvania’s Host Farms and the Borsch Circuit. Then rock and roll and disco in Michigan and North Dakota. Always throwing in some blues whenever I could get away with it because that was what I’d grown to love. Late at night you CAN get away with it in most rooms”. In 1989 a well-known studio in California approached her to teach for them. Which she did for seven years, before going “on her own”. Her technique is a mixture of the best she’s learned from all her teachers but mostly from her own EXPERIENCE. She says, “Most of my teachers told me what I COULDN’T do. And, I had to make a living from the time I was 18. Looking like I did, I was always cast as the belter, or the bad girl. Never the ingenue. So I belted out the songs in spite of what my teachers told me and I NEVER had vocal problems, ever. From my EXPERIENCE, I’ve formed the opinion that singing is more about muscle than anything else. That’s why I consider myself a vocal trainer. Like when you get a trainer to go to the gym. I train you so your muscles will support any kind of music whether it’s opera or hard rock. Almost all of my singers can sing anything. Unless they have consciously decided to zero in on one type of music exclusively. I’ve had opera students come to me to learn how to do Broadway and I’ve had pop singers come to me to learn how to belt without hurting themselves.